Today, eggplants (called aubergine in France) come in all shape and sizes. They range from small, round fruits about two inches in diameter, to the popular large oblong "black beauty" variety, which can grow up to 12 inches long. There is also Japanese eggplant, which is long and thin, closely resembling zucchini and has fewer seeds than other eggplants. The seeds of all eggplant varieties are edible. 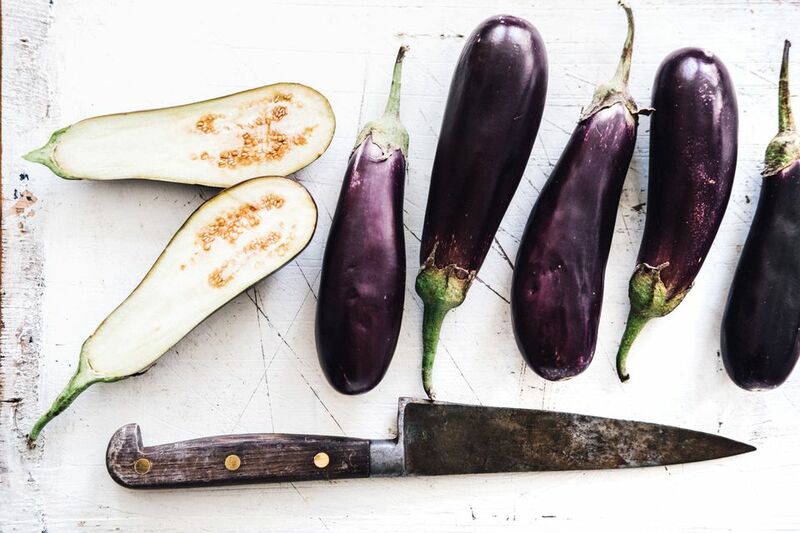 Eggplant colors range from white to lavender to dark purplish-black as well as pale green, yellow, and reddish. There are even some striped varieties. Various eggplant varieties may be used interchangeably in most recipes unless the skin color is a specific visual factor in the dish. Although available in most grocery stores year-round, prime time for eggplant is August and September in the United States. When buying, choose eggplants with smooth, shiny skin. The fruit should feel heavy for its size and have no blemishes, tan patches, or bruises. Wrinkled, loose skin is an indication of age, and the fruit will be more bitter. Smaller eggplants have fewer seeds, thinner skin, and tend to be sweeter, more tender, and less bitter. When selecting an eggplant, press your finger lightly against the skin. If it leaves a light imprint, it is ripe. If it is too soft, it is too old and will be bitter. Looking for fewer seeds? Check the blossom end of the fruit. A larger scar in this area generally means fewer seeds. Handle eggplants gingerly, as they bruise easily. If you purchase them wrapped in plastic wrap, remove the wrapper, cover in a paper towel, and place in a perforated plastic bag before storing in the refrigerator vegetable bin. Do not store raw eggplant at temperatures lower than 50 F (10 C). Cooked eggplant may be refrigerated for up to 3 days (it will get mushy when reheated) or frozen for up to 6 months in puree form (add a little lemon juice to discourage discoloration). It holds up fairly well in chunks in soups and stews when thawed in the refrigerator, but not as chunks on its own. Before freezing eggplant, you will need to follow a few steps. First, bring a large pot of water to a boil. Have a large container of ice water large enough to fit the eggplant. For slices: Peel eggplant and slice about 1/3-inch thick. Work quickly or the peeled eggplant will begin to brown. Place slices into boiling water and cover for 3 minutes. Using a slotted spoon, remove the slices to the ice water to stop the cooking. When cool, thoroughly drain slices and pat dry. Separate slices with plastic wrap, place into freezer bags, squeeze out all the air, and seal tightly. For chunks: Use the same process as above, except cut the eggplant into 1-inch cubes. You will not need to separate the chunks with plastic wrap. Label the sealed containers and freeze.